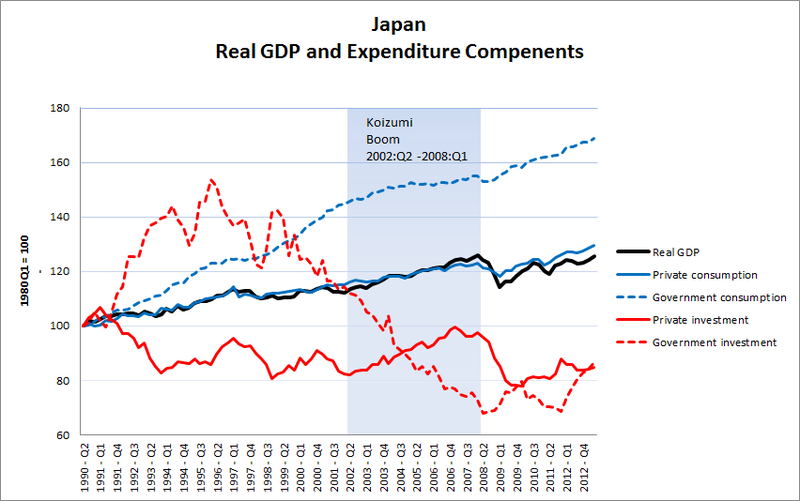 As the analysts note, a powerful fiscal stimulus in Japan helped to counter the demand shortfall. That caused personal consumption to continue to grow until 1997 and investment to rebound almost to its previous peak in just six years — something which isn’t slated for Europe any time soon. Well, the increase in G counteracting an unexplained decline in I is one interpretation. This is the "deficient demand" interpretation that so many like to portray as obvious. But in fact, it's difficult to ascertain the direction of causality from just a picture. So it seems that there was a boom in private investment during the Koizumi years (something that Krugman gets wrong here, and something I'm not sure he's acknowledged). Moreover, this boom coincided with a slowing or outright contraction in government purchases. And in a liquidity trap era, I might add! What do our conventional "deficient demand" theories have to say about this? Maybe there is something more complicated than a simple IS-LM+liquidity trap story going on? I'm just asking. Humbly yours, DA.